Tattoo Blog » Meet Miss Arianna! Tattoo Blog » Inspired » Meet Miss Arianna! Italy is a very beautiful country, so it makes sense that it would also be home to a tattoo artist who does very beautiful work. Miss Arianna makes her home on Italy’s Adriatic Coast at Skinwear Tattoo in the city of Rimini. For more than two years, Arianna went the traditional route of paying her dues and learning the ways of the tattooist through an apprenticeship. To her, the apprenticeship is a vital part of a tattoo artist learning to find their way as a serious artist. 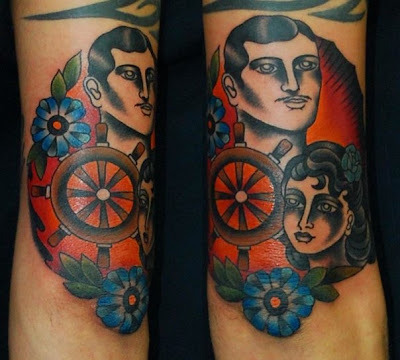 It’s this respect for tradition and understanding of its importance that underscores Miss Arianna’s tattoo work, yet at the same time the need to modernize and to move forward with her own twist on the classic American tattoo makes her work fresh and intriguing. The importance of tattoo artists who want to move forward and yet at the same time maintain links and a strong respect for the past is undeniably important. After all, trends come and go, but there is never a substitute for hard work and originality. Miss Arianna proves that. Please note: Comment moderation is enabled and may delay your comment. There is no need to resubmit your comment.